William Wylie would like to acknowledge the generous help he has received from his cousin Barbara Tylor (née Cox) in the preparation of both parts of his article by loaning documents and photographs in her care. "Ladysmith - civilians and soldiers take a breath of air"
To see a reprint of a letter sent home from South Africa during the 2nd Boer War is not uncommon. To see an actual letter as it left the hand of its author is quite rare. In the first of two articles about William Cox, his Great Grandfather, William Wylie brings us an experience which makes history come alive for everyone who reads one of his family's most treasured possessions - a letter written from Ladysmith shortly after it was relieved in 1900. Like most letters from the front, it was written using an indelible pencil on paper torn from a pad probably sent from England by well-wishers in a "soldiers' comforts" parcel. This is a carefully-written letter. You can see that William Cox has considered every word, every nuance of phrase before he writes each sentence so as not to distress his family. In England, there was very little comprehension of what a siege meant. Few here realised that conditions for every man, woman and child trapped in Ladysmith during the siege were horrific, nor could they know that by February 28th 1900, when relief finally came, just enough food remained in the town to supply the scantiest of rations for 3 more days. When General Buller rode into the Ladysmith and took the hand of General White, he brought with him a supply train and, immediately, the distribution of full rations began but that proved too much for a large number of men who died in great numbers from overloading their damaged digestive systems, the siege having lasted from 2 November 1899 to 27 February 1900. Sergeant Cox lived to come back to England and his family. The letter reveals a survivor who dealt with his many trials patiently and calmly but in his final sentence, this stalwart man shows us something of what is still going on inside him two months after the relief had taken place: "We can't compete", he writes, "with outsiders yet". 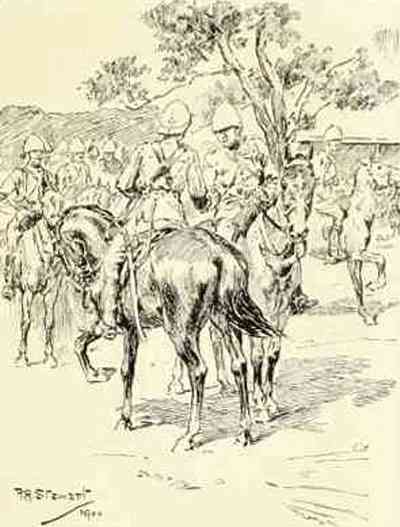 Sketched in situ by Frank Algernon Stewart, the official Boer War artist of the London Illustrated News who came to South Africa in October 1899.